Today I finally did it. I visited West Norwood Cemetery in London, thereby completing the final cemetery of the 7 Magnificent Seven cemeteries in London. To say that I am chuffed would be an understatement, especially when I consider what a beaut this one turned out to be. I was blessed with a clear morning for my trip, although the frost lay heavily on the ground (which made for stunning images too). The trip was via Clapham Junction and then onwards to my destination. Clapham Junction is quite a place too, but surprisingly easy to navigate if you know where you must be. Oh, and know which train to catch. The local I caught here was a Southern Trains local, and the trip to the station was quite a quick one. The walk to the cemetery was also a quickie, although I kind of got distracted along the way by a church (which also had a war memorial). Still, I am glad I did not have a long walk because I really needed my energy for the cemetery (as well as a full complement of batteries). West Norwood Cemetery is on the right with the brown fence. Immediately after entering the gate you come to the Cross of Sacrifice and the screen wall. There are 136 Commonwealth burials of the 1914-1918 war and 52 of the 1939-1945 war here and an additional 18 cremations of the 1939-1945 war. There is 1 Belgian war burial. I was not after any specific grave, in fact this was more of a touristy type trip, any CWGC grave that I saw I would photograph, but I was not there with a list and a predetermined route. The first breathtaker is very much the first thing you see when you enter the cemetery, and it is the Edmund Distrim Maddick Mausoleum of 1931. Spectacular is not the word I would use for this structure. It is truly magnificent, and what really makes it memorable is just how light and airy it was with its big windows and panels in the roof. There are a lot of mausoleums in West Norwood, and this was just the beginning! I could probably foam at the mouth about the mausoleums and statuary, I walked away from there with nearly 500 photographs, and I could show every one, and it could never really explain what this place was like. Like many of these Victorian cemeteries it was really an exercise in contrasts, the rich and titled competing with soldiers, children, ordinary people and a host of vegetation, wildlife and stone. Parts are wild and overgrown, and others are pristine, like the avenue above. In parts it seemed almost empty, but I remembered that an empty space does not mean that there is no grave there, it can also mean there is just no headstone. I also believe that quite a few memorials were removed, which could explain some of the empty areas. Naturally I watched out for angels and statues, I cannot help it, they tend to draw your eye with their magnificent and often decaying splendour. And there were lots to see too, and some I had not seen before in other cemeteries, while others were like old friends. Yes, I admit it, I am a sucker for a statue. Moving onwards I came to a very large area dominated by mausoleums, although I decided to not be lead into temptation and rather come back to it once I had done my circumnavigation. However, it was hard to walk past this area without looking. 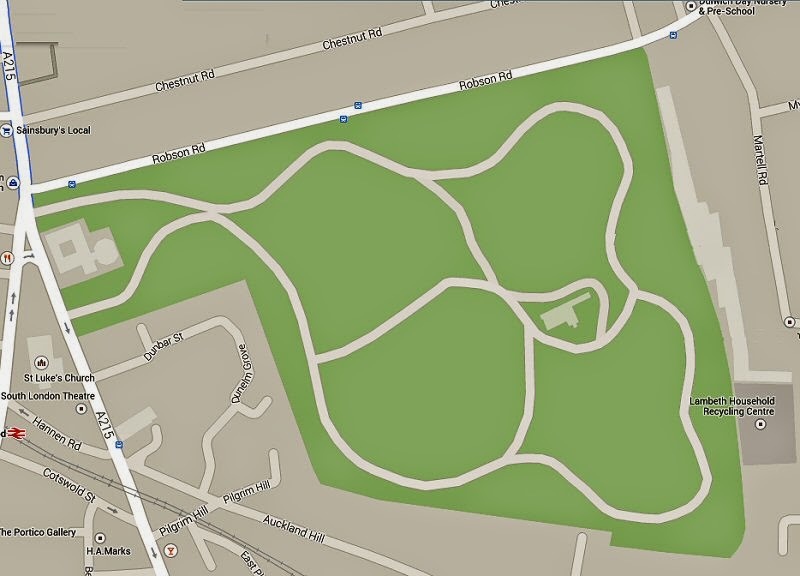 Speaking of circles: what does West Norwood look like from above? I did not have a handy plan with me, but it is not really a very complicated layout. I am pretty sure I walked the while thing flat though. There is a slight hill in the middle and the highest point is probably where the Crematorium is (the small building slightly off centre in the map). The cemetery is home to a working crematorium and burials are still held here. The cemetery was consecrated in December 1837 and has 164000 burials in 42000 plots. The standard of maintenance was good, grass was trimmed, paths were neat and generally the cemetery had a good feel about it. Parts of it are really wild though, at times almost impassable, but I had seen that in a number of the old London cemeteries and it is sometimes part of the ecology of the cemetery. I did get to see a fox on this visit, and I expect there is quite a lot of wildlife and birdlife here. I could not help but think that in our urban jungle these cemeteries are really very valuable green spaces, and at times they may seem to be overgrown, but just maybe that is a good thing too, because it allows for populations of small animals to exist in our crowded world. I did see a feral cat running around, as well as the usual squirrels, and of course you could hear the woodpeckers and see the many birds that live amongst our dead. I also noticed bee hives in the cemetery, and tried my best to avoid those, but the idea that we can utilise spaces in this way is a very attractive use for a dynamic cemetery such as this. I was now in the area around the crematorium which used to be the site of the Dissenters chapel. Both chapels were badly damaged during the war, and the current building bears no real resemblance to the original. Its not an ugly building, its just not a pretty one. There are two gems in the area of the crematorium, and they were both built by the architect Harold Peto, using terracotta. They are outstanding mausoleums, the one being for the Tate Family (of Tate and Lyle Sugar cube fame, as well as the Tate Gallery), and the other is for the Doulton Family. The Tate mausoleum was built in 1884, while the Doulton mausoleum dates from 1889. There is a similar one in Nunhead Cemetery too, and I managed to photograph it when I was there in 2013, but it did not seem to be as well maintained as this pair. It was time to head back towards the exit and I walked along the road surrounded by all manner of headstone, it was really difficult to keep in a straight line because I kept on dashing off to photograph a grave. My shoes were sodden from the wet grass, and I was already getting flashing lights from my battery meter. The cemetery has two gates, and the one I came to now was not the one that I entered from, although from this one I could see St Luke’s Church which dominates the crest of the rise. It had an interesting war memorial which I would return to photograph on my way home, but it was realistically time for me to turn around and head towards that gathering of mausoleums that I had seen earlier. This area was fascinating because in 1842, a section of the cemetery was acquired by London’s Greek community for a Greek Orthodox cemetery, and was this soon filled with many fine monuments and large mausoleums. The images of the statues above marked “Kneeling Angel” and “Mother with child” is from of the tombs in this area. Unfortunately a work crew were close by doing something mysterious with a grinder so I tried my best to look inconspicuous while in this area. There were a number of family vaults here that had a staircase leading down into them chamber underneath, and I was able to get a good look at the insides of one of them. We do not have this sort of thing back in South Africa, so my curiosity was piqued when I first found out about these vaults. Unfortunately though, the vandalism aspect for something like this is very high, and there was evidence that people were interfering with these resting places. There is a large columned chapel building here too and I suspect it ties into this Greek Orthodox area. It is a beautiful building, but again I did not have answers to my questions. In this image you can see the entrance to one of the underground vaults in the bottom left hand corner. Unfortunately the door has been broken (or was removed) and parts of the interior seem to have fallen in. Leaving the Orthodox section I headed across to an area that had scaffolding on it, and I believe this may be where the catacombs are. There wasn’t anything to see under the scaffolding, so I turned around and headed into the bushes behind the container. It was a good decision too when I look back on the pics I took. This beaut is the Alexander Berens Mausoleum, and it is fantastic. Entrance is through the front, and next to it is a smaller mausoleum is that of Thomas de la Garde Grissell. Slightly overwhelmed I found myself in an area that I had seen previously with the enticing name “Ship Path”. Being of a nautical bent myself I had to investigate it, and shall leave a tantalising clue on this page and will continue on the next page.